The early twenty-first century seems to be a fertile time for writing about the world around us. There are best-selling psycho-geographers, flaneurs and flaneuses and writers about the natural world. The urban environment, especially London, attracts many of them. 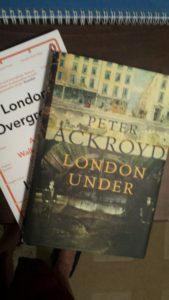 Examples are Iain Sinclair and his odyssey around London’s railways in ‘London Overground; A Day’s Walk around the Ginger Line‘ (Penguin, 2016), or Peter Ackroyd’s visit to all that lies beneath in ‘London Under‘ (Vintage, 2012). Both are fascinating and very good reads. But it is the recent rise to eminence of ‘nature writing’ which I find most interesting. That designation is not, by the way, mine, but one seen in a number of bookshops recently (and not just the big chains either). Britain has a long and honourable tradition of writing about nature, in prose and, of course, poetry. Some of my favourite poets write predominantly about the natural world. Gerard Manley Hopkins’ poems are inseparable from his joy in and fascination with nature, which, for him, was a reflection of the profound goodness that was God. Ted Hughes saw nature, in all its forms, with words and, for R.S.Thomas, the natural world was, often, a palimpsest of events, human and otherwise, over time. In prose there is a long line, stretching back to Gilbert White and his ‘Natural History of Selbourne‘ (1780s) and beyond, but recently joined by Robert Macfarlane. Fellow of Emmanuel College, Cambridge. Macfarlane’s debut ‘Mountains of the Mind‘ (Granta, 2003) was much garlanded with prizes, the Somerset Maugham Award, the Guardian First Book Award and The Sunday Times Young Writer of the Year Award. Here I must confess that, not being enamoured of mountains, I never read it. I did read his second ‘nature’ book, ‘The Wild Places‘ (Granta, 2007) and was hooked. Over 61 million people live in Britain in approximately 93,000 square miles of land and the roads we drive on, if laid end to end, would reach almost to the Moon. 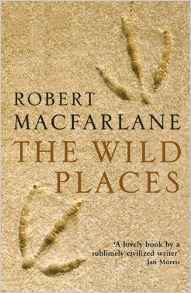 In ‘The Wild Places‘ Macfarlane seeks out those places in the British Isles which retain their wildness – islands, valleys, moors and forests, nesses and burrowed pathways – and writes about what he finds, encompassing their natural history and their history of interaction with humankind. I have read everything he has written since, including ‘The Old Ways; A Journey on Foot‘ (Penguin, 2012), ‘Holloway‘ (Faber & Faber, 2013) and ‘Landmarks‘ (Penguin, 2015). All of them save for ‘Holloway‘ won or were short-listed for major awards. ‘Holloway‘ is a very slim volume which while beautiful and very specific ( especially for lovers of Geoffrey Household’s ‘Rogue Male‘ ) still costs £9.99. 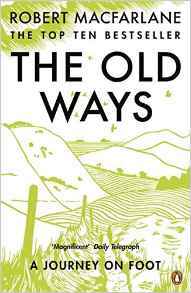 In ‘The Old Ways‘ Macfarlane walks pathways, forgotten droving roads, pilgrimage paths, pre-historic trackways and ancient rights of way, not just in Britain but in China, Spain and Palestine (in the latter walking with his Palestinian guide beneath Israeli gun emplacements). The inter-action of land and people is what interests him here (among many other things) and how it illuminates universal, as well as particular, human experience. Why do I think they are so good? First, the precision of Macfarlane’s prose, which is at once scientifically exact and lyrically beautiful, as he strives to put into words the way that land shapes people as well as how people shape land, with admirable results. Second, the sheer magnetism of the places where he ventures, the romance and beauty – he is drawn to these places by the same force which draws us to read about it. The urge of having a connection with the land is very strong. It is in his most recent book that two of his obsessions – the land and how we interpret it and the language which we use for the land – combine. 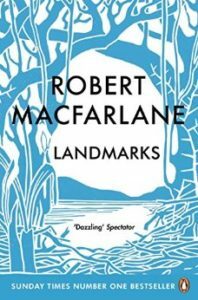 In ‘Landmarks‘ he writes about writers, people who have influenced him and his affinity for landscape. So, we meet Scottish Nan Shepherd, chronicler of the Cairngorms, English Roger Deakin, who swam across England, North American Barry Lopez and his love of the far north and others, older, Richard Jefferies, who wrote about the edge-lands of London and John Muir, founder of the Sierra Club and ‘Father of Yosemite’. Some of these people I had learned of before, some in Macfarlane’s writings, other were new to me and I will track them down. We also find a land glossary, of words, many dying out, for the land and the natural world. So, ‘shirr‘ – a ruffle on the surface of water (Cumbria), ‘gaffle‘ – of ducks, to feed together in the mud (Northamptonshire) and ‘lynchet‘- a slope or terrace across the face of a chalk down (southern England) as well as hundreds of other words, from Gaelic, Welsh, Jersey Norman, Cornish and English dialects. A whole lost, or almost lost, lexicography of the land. This is a book which I will read again and again, especially its glossary. Now I have to read some of Macfarlane’s contemporaries, I have Rebecca Solnit on my list and Alexandra Harris’s ‘Weatherland‘ on my bedside table. If you enjoyed reading this article you may also enjoy Summer Reading in Autumn Novels Historical Short Stories Naval Novels Vive la Revolution! This entry was posted in Literary Reviews, Nature Watch and tagged Book reviews, Nature by juliej. Bookmark the permalink.